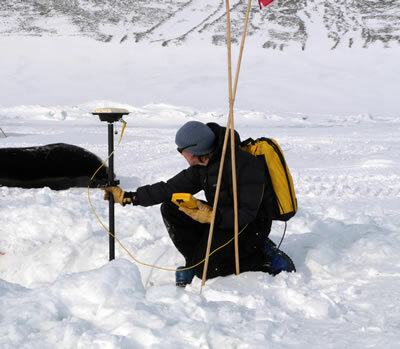 During the 2008-09 Antarctic field season, the UNAVCO polar group supported 24 individual PI-based science campaign projects. Sixty two receivers were sent to the continent for campaign support, including fifteen NetRS receivers. An additional ten GPS receivers remain on the ice to support long term data collection at WAIS divide under Slawek Tulaczyc. Real Time Kinematic (RTK) capabilities were provided to accurately calibrate navigation control for a state of the art underwater ROV (B-217). 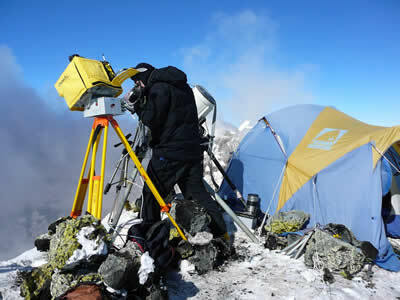 GPS instruments were also provided for the ongoing deformation studies on Mt. Erebus (G-081), the characterization of glacial and basal flow dynamics of the Thwates Glacier (I-206), and in support of the Dry Valleys Long Term Ecological Research projects (Doran, McKnight, Fountain). 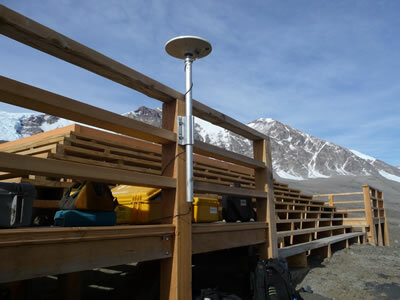 Additionally, two POLENET style continuously operating GPS systems were prepared for the Troll Traverse team (I-155) for installation at the Recovery Lakes site on the polar plateau. This season saw good use of UNAVCO's new terrestrial LiDAR capabilities. The gear worked quite well in most circumstances and broadened the tools and technological capabilities provided by UNAVCO. Investigators taking advantage of the UNAVCO terrestrial LiDAR included Diane McKnight (B-421), Andrew Fountain (B-425), Phil Kyle (G-081), Ron Sletten (G-121), Alan Ashworth (G-294), and Sujoy Mukhopadhyay (G-438). The continuously operating sites provided by TAMDEF and the Polar MRI projects continued to perform well, aside from sporadic issues with wind generators. Several sites were visited for minor maintenance and most had sustained well through the difficult winter months with minimal outages. Maintenance was performed at the CONZ installation, which also wintered well this past season. A seasonal NetRS Base station was provided at Lake Hoare to service regional surveys in the Taylor Valley. The NetRS was set up on LHOE as rising lake levels are quickly inundating the old BOB1 monument historically used by the LTER groups within the Taylor Valley. A new geodetic benchmark, BON1, was installed at Lake Bonney and tied in to the old Lake Bonney monument, BONN. This new installation is affixed to the railing of the helicopter pad near the main Lake Bonney camp. The old control point is in danger of inundation from rising lake levels. Data retrieval from Cape Roberts, Mt. Fleming, CONZ and MACZ continues through the Truncated Cones repeater site on Mt. Erebus. Data are downloaded daily and delivered directly to the UNAVCO data archive. The telemetered data is collected by receivers at the NASA building 71 in McMurdo. The Bldg 71 system was moved onto a dedicated server this season, and all IP's were migrated to a new USAP standard. The upgrades were trouble free with the exception of a failure of MCMD. This NetRS was quickly replaced with another unit on hand. Figure 1 - UNAVCO terrestrial LiDAR performs a time series scan of the lava lake in the caldera of Mt. Erebus (G-081). Figure 2 - UNAVCO engineer Marianne Okal precisely locates navigation nodes for the ROV SCINI (B-174). Figure 3 - New monument BON1 was created at Lake Bonney in the Taylor valley to better serve the LTER community. The old control point BONN is in danger of inundation from rising lake levels.